"They're calling this young man the Rasta Rocket!" FilmRise has debuted the official trailer for an indie sports drama titled Sprinter, from Jamaican director Storm Saulter (Better Mus' Come). This premiered at the American Black Film Festival and is getting a VOD this spring, for who those who want to check it out. Sprinter is about a talented Rastafarian teenager in Philadelphia who hopes to qualify for the national youth track team for the World Youth Championships. Newcomer Dale Elliott stars as Akeem Sharp, who is set to be Jamaica's next big track-and-field sensation. Real-life Jamaican track sensation Usain Bolt makes an appearance as well, of course. The film also stars Lorrain Toussaint, Kadeem Wilson, Dennis Titus, Shantol Jackson, Bryshere Y. Gray, and David Alan Grier. Featuring songs by NE-YO and Jamaican dancehall performer Shenseea. Executive produced by Jada & Will Smith, and Richard Jefferson. See below. Sprinter tells the story of Akeem Sharp (Dale Elliott), who is set to be Jamaica's next big track-and-field sensation. Akeem hopes a rise in the track and field world will take him to the U.S. to reunite him with his mother (Lorrain Toussaint), who has supported the family while living as an illegal resident for over a decade. But Akeem's rising star is weighed down by turmoil at home: a volatile father, and an unruly older brother who insinuates himself into Akeem's career as a means of escaping – or perhaps enhancing – his scam artist hustle. Not only does Akeem have to prove to himself and everyone that he can succeed, but also overcome the struggles that may ultimately bring him down. 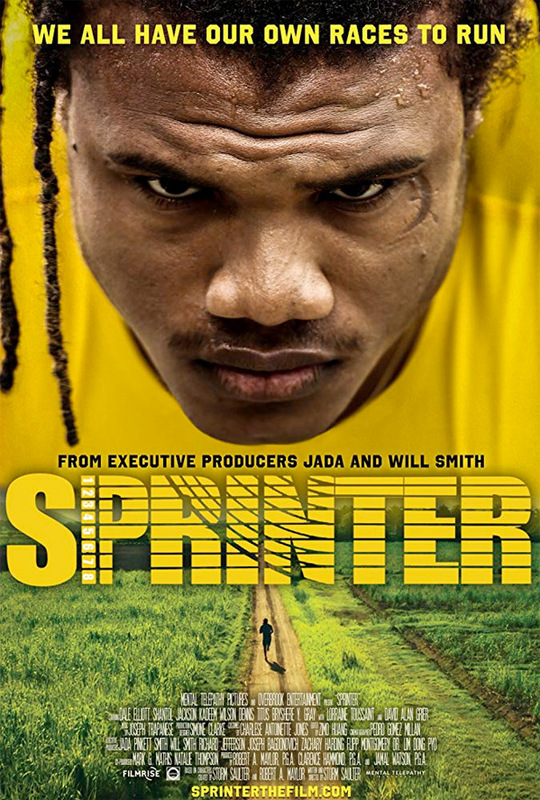 Sprinter is directed by Jamaican filmmaker Storm Saulter, his second feature after making Better Mus' Come previously. The screenplay is also written by Storm, based upon the original characters created by Robert A. Maylor and Storm Saulter. This premiered at the American Black Film Festival last year. FilmRise is releasing Saulter's Sprinter direct-to-VOD and "Theatrical On Demand" this spring. For more info, visit the film's official website. Thoughts?